A reliable source for Brush information and leading Brush Companies & Manufacturers. Power Brushes Power brushes are metal or abrasive nylon filament brushes used to deburr parts during initial phases of the surface finishing process. Gordon Brush is an ISO 9001:2008 certified manufacturer of standard & specialty brushes for the commercial, aerospace, military, medical & electronics industries. Spiral Brushes manufactures industrial brushes, custom brushes, power brushes, wire brushes, conveyor cleaning brushes, steel brushes, stainless steel brushes, brass brushes, nylon brushes, abrasive nylon brushes, and natural fiber brushes. Our brushes set the standard for the industry. Our customers know they can trust us to provide the highest quality products whether they are stock brushes or custom orders. Sealeze offers quality brush options, both stock and customized. As leaders in the industry, we dedicate ourselves to offering products manufactured from a variety of high-quality materials in order to ensure your brush best suits your application. The Industrial Brush Co. is a provider of brushes. Since 1946, we have been committed to providing high quality brushes and customer service for a variety of industrial applications and marketplaces. The scientific and laboratory industries would be lost without us! Since 1929, we have provided exclusive brushes for scientific and laboratory use designed with precision use in mind. Precision Brush Company is an industry leader that has the technology, expertise and experience to satisfy all of your brush requirements. 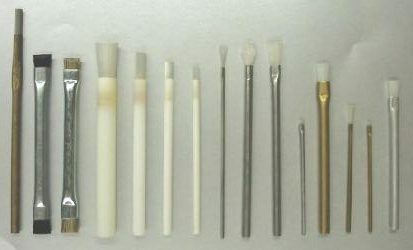 Braun Brush is committed to manufacturing quality brushes using a variety of methods. We offer convenient purchasing of the most extensive brush line available & a unique design-your-own brush service on the web. West Coast Brush is a leading manufacturer of brushes. We use state-of-the-art technology, allowing us to manufacture almost every size and shape. For over 30 years, Tanis has been a leading brush manufacturer. Tanis has put innovation to work in everything we do, using the latest technology, materials, manufacturing advancements and engineering expertise. Fill material, or "filament," is crucial in power brushes, since many industrial processes depend on the ability of a power brush to properly remove burrs and sharp edges from parts so they can perform uniformly and safely. Most power brushes have crimped steel, stainless steel, bronze or brass wire filament; only the tips of the brush's wires have the ability to cut, and as the brush is used the wires break and form new cutting tips, a process that is aided by crimping the wires. Nylon abrasive filament is also used in many applications that require finer or non-metallic deburring. This material is made abrasive by impregnating nylon with silicon carbide, aluminum oxide, or polycrystalline diamond abrasive grit, which, depending on the size of the grit, can achieve various levels of cutting, deburring, blending or polishing. Both metal and abrasive nylon filaments may be "encapsulated" in an elastomer coating to amplify cutting capacity. With all the different types of configurations available, power brushes can provide surface conditioning solutions for parts of virtually any size, shape and material. Power brushes can be used for metal deburring; removing rust, paint scale, or other coatings; gear and thread cleaning; surface preparation; cleaning; finishing and weld blending. They work on most materials, including aluminum, steel, carbide, plastic, wood and glass. Alternatives to deburring power brushes are deburring machinery such as tumblers, vibratory finishers and multi-process deburring equipment. These machines are generally effective, but they must usually be purchased as large units, which are far more costly than power brushes, which can be attached to a manufacturer's pre-existing equipment or modified to fit an already constructed assembly line. Power brushes achieve uniform surface conditioning when used properly, and they offer a cost-effective solution for industrial deburring and surfacing.